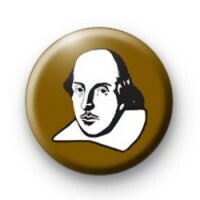 A brown Shakespeare badge featuring a bust of the famous playwright & poet. William Shakespeare is synonymous with theatre & school English lessons. This year is the 400th anniversary of the famous Bards death. This badge is perfect for schools, for both English teachers & drama teachers. The author of Romeo & Juliet celebrated in button badge form. Standard 25mm button badge hand made in our UK workshop from metal components with a plastic coated design & copper pin back. Thank you so much for the badges, they're absolutely fantastic!